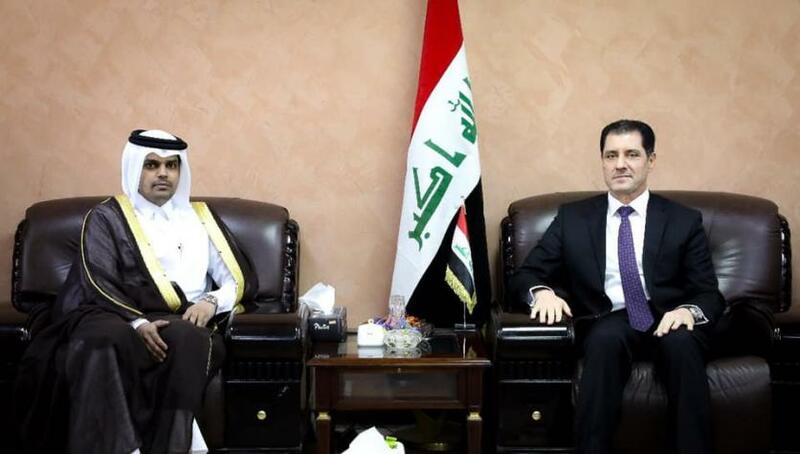 The Minister of Planning, Dr. Nouri Sabah al-Dulaimi, received on Tuesday the head of the Qatari delegation to Iraq Hussein Ali al-Fadala and his accompanying delegation. The meeting discussed joint relations and means of enhancing them and facilitating procedures in various fields of cooperation. The two countries. During the meeting, the Minister of Planning praised the efforts of the State of Qatar to assist Iraq in restoring and restoring the stability of the liberated areas and the economic and investment role in Iraq, which was reinforced by the visit of the Iraqi delegation to the country recently headed by the President of the Republic of Iraq. Dr. Nuri al-Dulaimi explained to the Qatari delegation the main features of Iraq's vision for sustainable development 2030 and the role of investment that can be exercised by local, regional and international companies in Iraq, especially in light of the security stability achieved by the efforts of our heroic security forces. For his part, praised the heads of the Qatari mission and the delegation accompanying him, the strategic plans of the Ministry of Planning, stressing their lack of savings for any effort to serve Iraq, while the head of the mission to form a large delegation of Qatari businessmen, confirming the arrival of this delegation to Baghdad during the month of February, Next, in order to achieve these goals.